Same year, same guy, but a lot better than the previous post. There are loads of reasons to dislike Bappi Lahiri. Like when he shamelessly steals other people's music; a near endless line of tacky rip-offs. But there are reasons to like him as well. Like when he steals other peoples' music, but actually gets it right. Case in point: 'Sab Kuchh To Hai'. Essentially a remake of 'The Sound Of Silence', but for once Bappi brilliantly manages to redefine the source song, turning Simon & Garfunkel's classic into a slow-burning, late night lounge track. It's wonderful. And so are the other two Asha Bhosle numbers here. 'Jeet Lo Haar Ke' is quirky, disjointed disco, 'Sheesha Sharab Shabnam' is more lounge, on a cool jazz tip this time. This one looks very promising. Actually, Deven Verma and Amjad Khan are actors in the film as well...can't wait to hear the song they sing! I did not know they COULD sing! 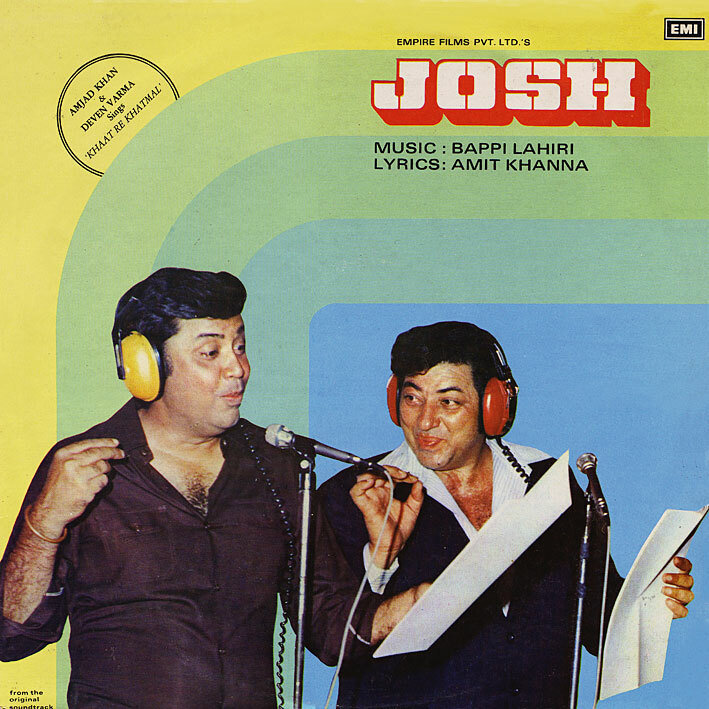 The 2 guys on the cover are not really professional playback singers, but actors - Deven Varma with the yellow headphones & Amjad Khan ('Gabbar Singh' of Sholay fame) with the red ones. I was wondering what they were doing there until I saw the the tracklisting. Song no. 3 (Khaat Pe Khatmal) was 'sung' by them. You beat me to it this time ! My bad, for not knowing much (anything) about the films the soundtracks are from... I had no idea who these guys are. Don't know if it's a novelty song, but it does have sound affects (plus the Looney Toons intro at one point), so could be. I'm an avid fan of this blog since its inception. Though, I'm a regular visitor, I remain reluctant to comment in your releases generously, except when a link is dead or like that. I discovered lately while trying to grab this particular release through Rapidshare that, you did not upload this onto Rapidshare using neither a premium nor collectors' account, thus link gone DEAD! I don't know how to offer my gratitude to your excellent hardship you've been offering us. By the way, would you if like, I can share my Rapidshare premium account for "Music from the Third Floor". The cost (whatever) will exclusively bourn by me. If you agree, then pl. reply here with your email and I'll reciprocate accordingly. I actually think my current method of uploading, ie. to a service that redistributes the files to various hosts, works fine. If one of the resulting links expire, so be it, they're not necessarily meant to last forever - in this case there are still four links that work. And to be honest, I'd feel uncomfortable uploading to an account that belonged to someone I don't know. So thanks, but no thanks. Again, thank you for the offer - but I'll stick to using Sharebee as that makes the file available from a wide range of sources in one (free) go. An additional upload to RapidShare is simply more work. I had been looking for Sab Kuchh To Hai for ages and came across this page by accident! Thank you SO much for sharing the whole album!! !